I've previously written about how I never used to care much about my companions' looks, until some of my inquisitor's companions looking way off gave me pause for long enough that I ended up buying them some gear that was more appropriate for their roles and characters. Lately I've discovered a new hobby that is somewhat related: dressing my companions so they look like player characters. If you're the type of person who wears a full Cartel Market outfit and just clones it for all your companions, this might not seem like a big deal, but considering that most people I know tend to mix and match a lot of their gear, trying to copy any given look can actually be pretty interesting (and amusing). Even if you ignore the different body types and the giant assault cannon strapped to my character's back, it's not a perfect likeness - I was lazy and didn't bother to replace Elara's belt, and the boots she's wearing are a similar-looking but nonetheless different model to mine. 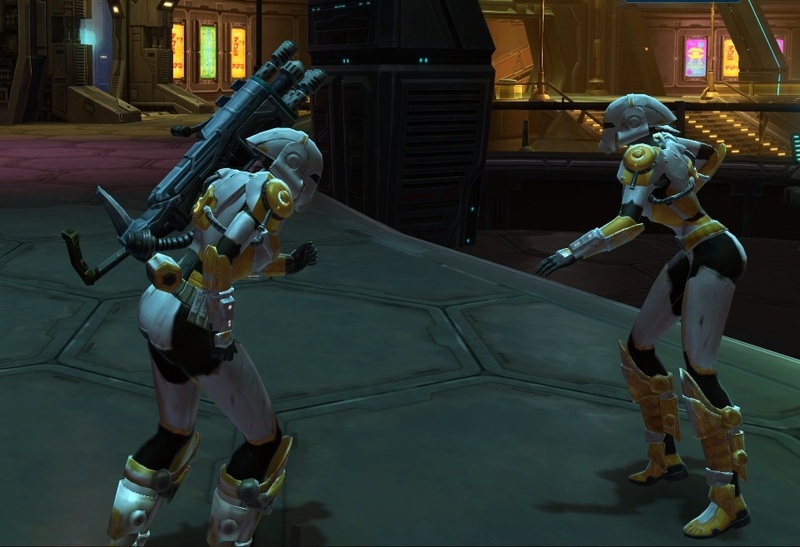 Still, at a glance we make pretty good twins... and it amuses me to basically see "two of me" running around the fleet. Of course you can then take it a step further and copy other people's looks. It only really works well if they display their helmet (and your companion can do the same), because otherwise the head and face kind of dominate the picture and that's something you can't copy. Body types pose a limitation as well, but still... you'd be surprised by the results you can achieve with just a couple of key pieces and the right dye kit. Tanking pet or pet tank? Who can tell? Disclaimer: Shintar recommends that you don't do this with people who are easily freaked out by you stalking their characters and staring at their gear as you make plans to copy their looks. Shintar also won't be held responsible for any negative consequences caused by pretending that your companions are other players and said other players taking offense at seeing their lookalikes get bossed around by you. Heh. Reminds me of some moggers who hang around Stormwind/Org and other cities, snooping around for cool outfits to try. 1 Topek is bad enough, please no more Shin! 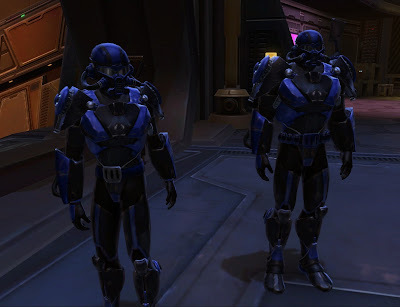 Usually, I don’t invest much time and effort to make my companions look outstanding as I have them wearing crafted gear. However, I did model my Sniper after her first companion, Kaliyo. They look almost identical and both are wearing the Red Scalene Armor without displaying their helmets. That makes for some very entertaining moments.